We've added over 15 hours of new video footage to keep you at the forefront of cannabis education. Go inside some of the industry's leading grow operations and extraction labs and get real industry insight from the world's top growers, budtenders, extraction technicians, and doctors. More Courses & Info Than ALL Other Cannabis Colleges! More Graduates than ALL Other Cannabis Schools! The Only Cannabis College with a Complete Curriculum that Covers ALL Areas of the Industry! This is an exciting time for the medical cannabis industry. Many areas of the USA, Canada, and around the world, are reforming their cannabis laws, leaving a massive opportunity for qualified cannabis professionals. Now thanks to CTU, no matter where you live – you can get in on the ground floor with expert cannabis training. 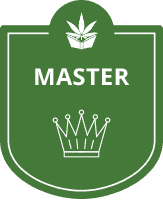 As the world’s largest and leading online cannabis school, we offer a complete curriculum for all skill levels. 9 Essential Skills. One Complete Certification. Start Earning Your Master of Marijuana Certificate! Ed is a California horticulturist, author, publisher, and Cannabis grower known for his advocacy for the legalization of marijuana use. He served as a columnist for High Times Magazine during the ’80s and ’90s. We are lucky to have him on our team. Ed Rosenthal is known as the Guru of Ganja.